Here’s a quick round up of resources available to help you get started with the new AASL Standards as well as an overview of key vocabulary related to the standards. The standards: Aside from purchasing the book, The Framework for Learners is available for free here. To access all 3 frameworks (Learner, School Librarian & School Library), you can download the app for $12.99, but hurry because Jennisen Lucas said the price is increasing to $19.99 on February 15. One nice thing about the app is it allows you to create a profile where you can take notes. The AASL Standards website: More resources are being added weekly to http://standards.aasl.org, including Where do I start?, How to Read the Standards, discussion forums, one pagers for admins, teachers & parents, and more. Twitter chats: @AASL is hosting Twitter chats about the standards. Don’t worry if you missed the first one because they are being archived. Here is the Archive of Jan. 25th Chat. The next chat (Wednesday, Feb. 7 6pm CST. #AASLstandards) is for supervisors, but all school librarians are welcome, and most of the questions seem applicable to all. Webinars: There have already been several webinars. I recommend Wyoming State Library’s webinar series, where AASL Affiliate Jennisen Lucas gives an overview of the standards, and then goes in depth with the shared foundations, starting with “Inquire,” where she walks us through deconstructing the competencies across grade levels. #NotatAASL LiveBinders: Curated resources from #AASL17 and #NOTATAASL hashtags before, during and after the National Conference for the American Association of School Librarians, Nov. 8-11, 2017, Phoenix AZ include a section with AASL Standards Resources. Shared Foundations: the six core educational concepts that anchor the standards are I. Inquire, II. Include, III. Collaborate, IV. Curate, V. Explore and VI. Engage. Domains: The knowledge, skills and attitudes necessary to enact the standards are developed in the learning categories of A. Think, B. Create, C. Share and D. Grow. Competencies: The measurable statements within the standards for learners and librarians are the competencies. For instance, learner competency IV.B.4. states that “Learners gather information appropriate to the task by organizing information by priority, topic or other systematic scheme.” We label it IV.B.4 because it is the fourth competency for learners listed under the Shared Foundation of IV. Curate in the Domain B. Create. Alignments: For school libraries, the competencies are called alignments. This semester I’ll be taking a deep dive into the new National School Library Standards for Learners, School Librarians and School Libraries and exploring how those fit into my role as Future Ready Librarian. To begin, I’d like to take a look at the Six Common Beliefs or guiding assumptions upon which the standards are based. For a great overview of how these updated belief statements compare to the nine Common Beliefs of the previous standards, see Hilda Weisberg’s blog post. 1. The school library is a unique and essential part of a learning community. 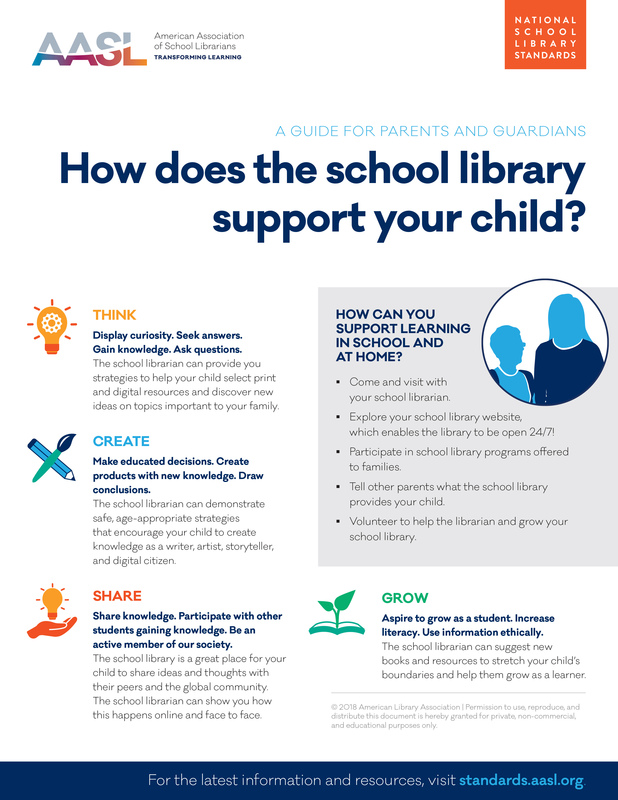 I want my library to be the “hub of the school.” Empowering students as creators has been of great importance to me, not only in terms of the resources available at the library for students but in helping this to become an Academy priority. I want my students to be creators and not just consumers of technology, and I advocate for this with the staff in my role facilitating teacher technology goals within their professional learning plans. 2. Qualified school librarians lead effective school libraries. Juggling the many roles of the librarian can be a challenge, but I think leading beyond the library is important. I serve as Academy Technology Committee Chair and Future Ready Project Manager. My responsibilities include mentoring staff in their technology professional learning goals and planning Academy technology professional development. I stay current on ed tech by maintaining a strong PLN on Twitter and serving as a Board member and active participant of the Education Technology Association of St. Louis. 3. Learners should be prepared for college, career, and life. This belief stems from the idea that “the purpose of learners’ education is to empower learners to pursue academic and personal success, whether in inquiry, advanced study, emotionally and intellectually rewarding professional work, or community readiness.” This aligns with the mission of The Alliance for Excellent Education, the organization behind the Future Ready movement. The Alliance is dedicated to ensuring that all students “graduate from high school ready for success in college, work and citizenship.” The Future Ready Schools initiative is based upon the idea that implementing “personalized, research-based digital learning strategies” will help students achieve their full potential. This year our Academy began our back-to-school professional development considering what makes an ideal graduate and what we do as educators to develop this. This began an Academy-wide focus on adopting the essential elements of Project Based Learning. This shift to inquiry-based learning has been a opportunity for me as the information specialist to serve as a resource to staff and students. 4. Reading is the core of personal and academic competency. Along with utilizing “motivational reading initiatives” and using “story and personal narrative to engage learners,” this guiding principle also recognizes the role of the Future Ready Librarian to ensure “up-to-date technology and digital and print materials that include curated open education resources.” OER is a big push within the Future Ready movement. Meeting the independent reading needs of my students and fostering their love of reading is a major focus of my library and our LFLA Reads program. I have not been as focused on OER, but I know that the #GoOpen Missouri Education Initiative has some great resources. 5. Intellectual freedom is every learner’s right. I am excited to be attending Dr. Kristen Mattson’s METC18 preconference session “Digital Citizenship: Moving Beyond Personal Responsibility,” which will be focused on empowering students as members of digital communities. 6. Information technologies must be appropriately integrated and equitably available. At my high poverty, Title I school, this is a huge issue. Since I came to the Academy as Library Media Specialist six years ago, I have been an advocate for improving our infrastructure, technology support, the number of devices and the quality of technology professional development. We now participate in E-Rate, have increased technology support from 10 hours per week to 30, have more devices thanks to switching from laptops to less expensive Chromebooks, have adopted Google Suite for Education, and use the SAMR (substitution, augmentation, modification, redefinition) model as a framework to improve technology integration. Yet, my students still experience barriers to access at home. In a recent survey of our high school students only 37% have a computer at home with reliable internet service, creating a “homework gap.” I am currently working on a partnership for next year that will bring Chromebooks to the library that are available for students to checkout overnight.